BRICK BY BRICK: EP Brick is jointly owned and managed by Martin brothers, from left, John, Bruce and Billy. Brick by brick, Nelson Mandela Bay’s Martin family have been hard at work building one of Port Elizabeth’s longest-standing family businesses into the solid manufacturing concern it is today. 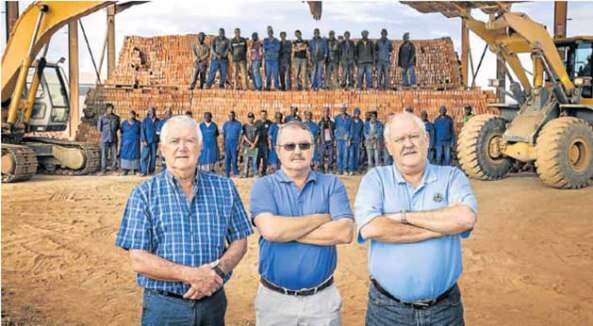 Swartkops-based EP Brick, a third-generation family enterprise of clay miners and brick manufacturers, recently celebrated a solid 80 years of contribution to the greater region’s infrastructure and overall built environment. Today, EP Brick – which is jointly owned and managed by the Martin brothers Billy, John and Bruce – significantly produces between eight and 12 million clay bricks, in four varieties, every year. Founded on decades of inter-generational knowledge and experience, ingrained best-quality standards and the ability to meet and exceed their customers’ expectations, the Martin’s products are not just another proverbial brick in the wall. The company, which lays claim to being the second-largest brick producer in the Nelson Mandela Bay area, comprises its clay mining operation, a brick molding, drying and kiln-baking operation and a logistics arm. Outlining the history of the brickfields company – which was built from the ground up alongside the significant clay deposits in the Swartkops River flood plain by William Martin snr in 1936 – Billy Martin said ownership of the clay mine, along with the brick factory, was passed to his father, also named William “Bill”, after their grandfather died in 1963. “During this time, the company experienced many challenging changes, especially in the burning techniques changing from Scotch and Beehive kilns to the Clamp kilns still being used today.